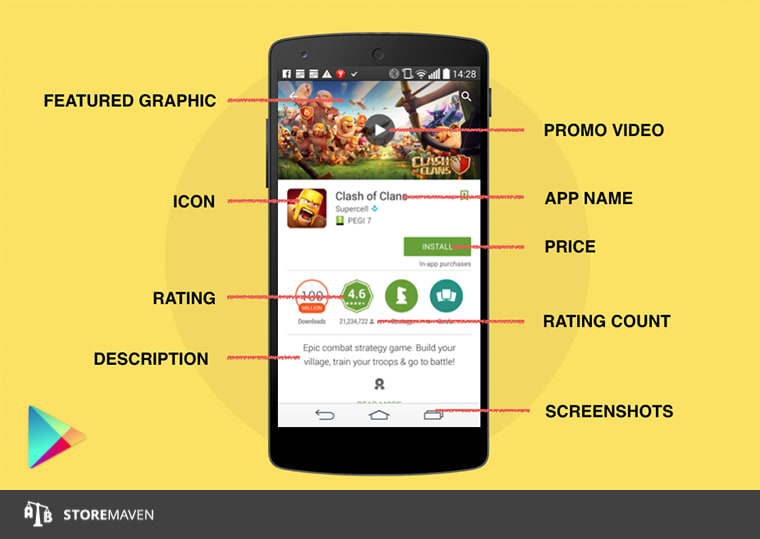 Designing a better Google Play page can double your conversion rates. Getting there requires an iterative process of testing your marketing assets. We’ve made this guide to ensure you have a solid foundation for designing the most impactful elements of your Google Play page. Note: Google and Apple have fundamental differences in layout, making user behavior fundamentally different, as well. There is nothing more important than a Featured Graphic on your store page. It is the first element presented on your page and is the only image that appears for Decisive Visitors. And since Decisive Visitors are much more common in Google than in iOS, this means your Featured Graphic is the only visual the majority of users will see before deciding whether or not to install. Before testing any other element on the page, focus your energy here. Use strong messages (but keep text short) and use strong colors (black and white tend to blend in too much on a device) and read this guide to Featured Graphic creation. In Google Play (unlike iOS), video-watching is the primary Exploration Action that users take on the page. You have a lot of freedom with a video in Google – you don’t have as much of a length restriction, and you can choose any contact and sounds that you like. Another added benefit of videos on Google Play? Since you need to use a YouTube clip, views in your Play store actually count as hits on your YouTube video as well. We strongly recommend using a video in your Google Play store, but any video is NOT better than no video. If your video does not meet user expectations or does not represent the app as well as it should, you will significantly damage your CVR. Start by testing different concepts: Do app screenshots work better than a conceptual, ad/branding type video? Does music work better than narration or silence? How long should the video be? Once you start answering these higher level questions, you can start making high-converting content. The 80 characters you have to give a quick description of your app have excellent potential to boost your install rates (we’ve seen increases of up to 30% in tests). Unlike in iOS, your Short Description appears above the image gallery and above the fold, meaning it impacts 100% of your users. The majority of users will not open up your full description, so these 2 sentences need to do enough to convince visitors that this app is worth their time. Follow principles that you’d use in an ad – catchy texts that highlight your top USP. As many of you may have (painstakingly) discovered, sometimes your killer iOS screenshots decrease your conversions in the Google Play store (and vice versa). Screenshots both serve a different purpose in Google Play (only Exploring Visitors encounter them when they have already decided to search for more info) and appear differently. It’s crucial to make sure screenshots don’t repeat the messages users understood from the marketing assets above the fold. On top of that, the images themselves are smaller, making fonts and in-screen images that work on iOS harder to read even if your device might be bigger. Google offers you the choice of using landscape or portrait images – the advantage of landscape is that you get to use a larger image (it takes up the full screen width), but with portrait images, you get to show more images at once. Test to figure out which works better for you! And keep in mind, only a small percentage of users will go through your full image gallery, and very few will click to expand your full image. Make sure fonts and graphics are very clear, and as always, place your strongest messages first. Use your A/B tests to learn more than just what wins and what loses – you need to focus on why. What did users coming in to your A variation do that users to your B variation did not? If you find that your video decreases conversions, look for the content that turned users away. Was there content that drove conversion? Knowledge is power, and knowledge is necessary to watch those install rates go up.